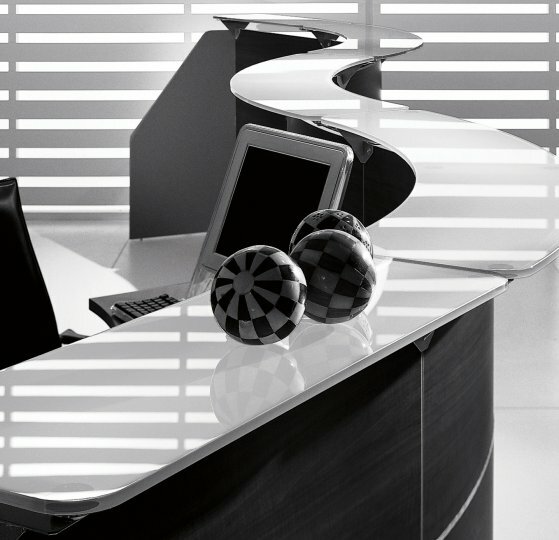 Edison reception desks are one of our most popular ranges of reception desk available to you. Although there are only a small number of component modules, a large number of exciting shapes and configurations can be created. 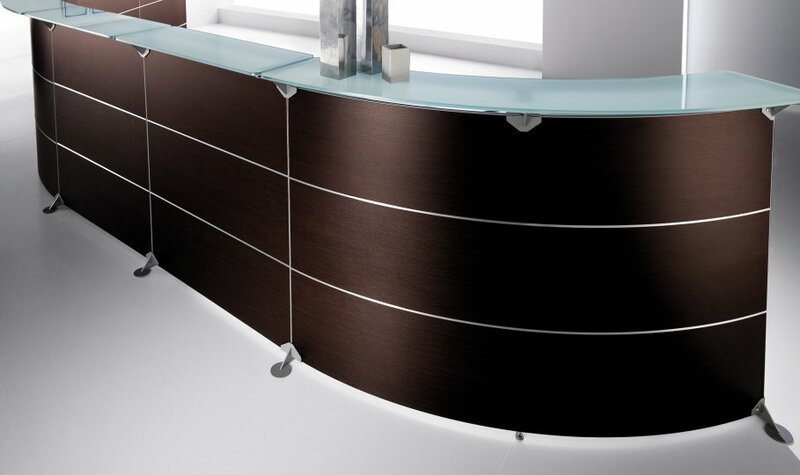 Reception fronts are offered in Walnut, Dark Oak, White, Maple, Silver and Mahogany. 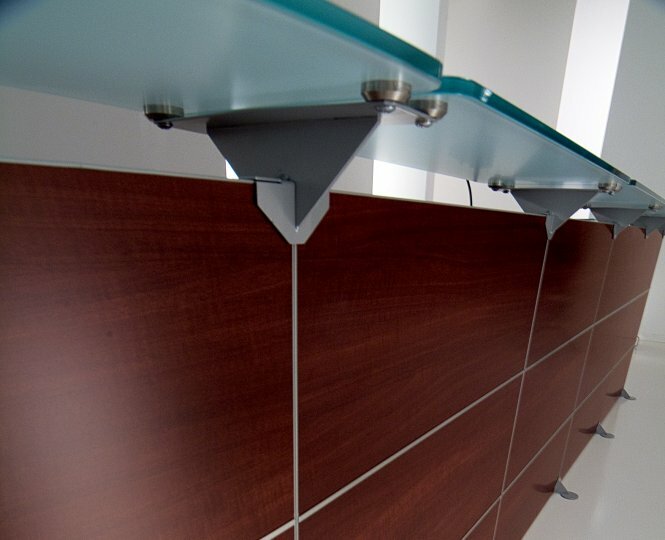 Countertops are laminated glass or in matching or contrasting wood finishes. Your reception area is nearly always the first place that any new visitor, whether they be an existing or potential client will see when they enter your office. You can understand then that it is imperative that you create an area that is both inviting and comfortable as well as giving a positive reflection of your company. The first factor that you want to consider when refurbishing your reception area is the decor. Try to pick warm colours that are aesthetically pleasing. You may want to begin with looking at your companies colours and how you can use them in this area. By using your company colours as part of the decor, you can help give the reception some association with your company. Next, you want to look at the reception furniture. Faux leather and leather sofas and tub chairs are most commonly used in receptions, particularly with a black finish. You ay want to avoid using this and go for something that is a bit brighter and colourful, but there is a reason why Black faux leather is popular so it may be worth not writing this off straight away. If you require any help or advice when refurbishing your reception area, our design team are more than happy to aid you. The Edison reception desk range is hugely versatile and will give your reception area a touch of class. These desks are modular and even though there are not many sections to choose from, there is a huge number of combinations that can be made to suit any area. Manufactured to an extremely high quality in Italy, the Edison reception desks are on a lead time of 3-4 weeks. The desk can be delivered flat packed for self-assembly or installed via our nationwide reception desk installation service for an extra charge. If you would like to take advantage of our installation service, then please call our sales team. We also provide a free design and space planning service in support of this range of reception desks. Our design team will provide 3D drawing of how the Edison reception desk will look in your space, all we need from you is the quantity of furniture you are looking to purchase, the dimensions of your reception area and the style of reception furniture and we will happily provide a plan and 3D visuals for you free of charge. Please call us on 01823 663880 to discuss your requirement.